Getting true picture soon. BIG POWER!!! V8!!! Located in Ft Pierce and on Clearance. 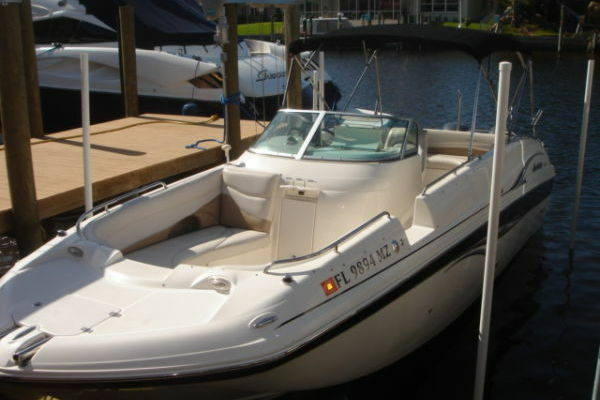 59990.00 Call for lowest prices for Monterey boats in USA. Actual boat in Ft Pierce. Can be delivered out of Melbourne location too.Powerboat performance and day boating versatility, make the Monterey 238SS an unbeatable combination. Equipped with luxurious aft sun-pad with aft facing flip-up bolster, the 238 is a sun worshiper’s delight! Standard features include an ergonomically designed helm station, multiple dedicated storage options, spacious seating accommodations, and telescoping and recessed boarding ladder. Add in the optional wakeboard tower, and you’ll have everything you need to enjoy your time out on the water to the fullest! Add tax tag fuel and delivery. Trailer is additional charge. United Yacht Sales New Jersey would love to guide you through a personal showing of this 23' Monterey 238 Super Sport 2018. This yacht for sale is located in FORT PIERCE, Florida and priced at $59,990. For a showing please contact us by filling out the form on this page and we will get back to you shortly! Equipped with one of the largest sun pads in the industry for a boat of this size, the 238 is a sun worshiper’s delight! The sunpad also features the Monterey Signature flip up backrest for aft facing transom seating. The 238 also comes with Monterey’s highly popular trunk storage for all your accessories and gear.Speaking of seating, the 238 is also available with your choice of a portside bucket seat, or a multi-position flip up backrest that turns the port side seating into a massive chaise lounge arrangement maximizing available space.